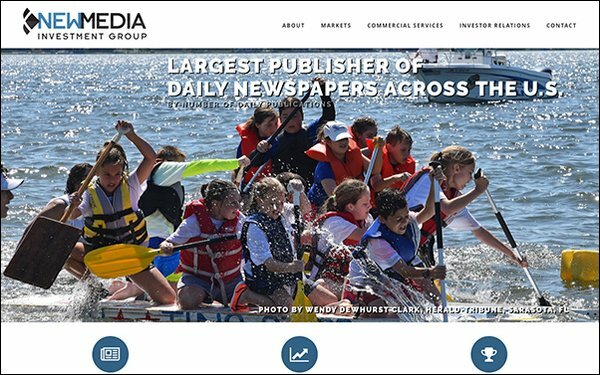 New Media Investment Group Inc., home to newspaper conglomerate GateHouse Media, reported financial results for Q4 and full-year 2018 finances. According to the report, New Media’s total revenues increased by 5.5% to $416 million in Q4 and $1.53 billion for the whole year, a 13.7% increase to the year prior. The business, like many others, saw a double-digit uptick in revenue across its digital properties totaling 16.4% for the fourth quarter of 2018. Digital revenues amounted to $179.2 million, an increase of 25.2% year-over-year for the entirety of 2018. New Media’s print advertising revenue took a hit, reportedly down 13.7% from the year prior, while circulation revenue, the company largest individual revenue category, decreased by 2.2% compared to the year prior at $575 million. “We implemented a strategic shift this year to focus more on driving volumes, especially digital subscriptions, while relying less on pricing to build our consumer revenue foundation. To accomplish this, we created a centralized consumer agency with dedicated talent who are investing into customer acquisition channels and focused on retention and our customer experience," stated Michael E. Reed, New Media president-CEO. Reed noted the decline in Q4 circulation numbers reflected this shift and the impact of hurricanes on business. GateHouse Live and Promotions also saw a 23.8% increase compared to 2017, bringing in $10.2 million in revenues. According to the report, the company’s commercial print, distribution and events revenue totaled $153.6 million, marking growth of 5.7% versus the year prior. The company, which now owns 146 daily publications across the U.S. and operates in over 580 markets in 37 states, counted several acquisitions among its business highlights for the year. In October, New Media closed the acquisition of The Oklahoman in Oklahoma City, Oklahoma, for $12.5 million. New Media’s acquisition of Progressive Business Media closed in November for $35 million. The company also reports revenue of $26.9 million, an increase of 29.6%, of its small- and medium-sized business solutions platform UpCurve in Q4. UpCurve saw increased growth of 37.5% compared to 2017 in 2018. New Media also announced the departure of its CFO Greg Freiberg, who is leaving to pursue other opportunities after five years with the company.